OK, by nature of the fact that I am reviewing Shadow's Edge, which is Book 2 in the Night Angel Trilogy, there will, of necessity, be implicit spoilers. I mean, if I talk about a character in book 2, that means he/she survived the first book, which may ruin a surprise or three for you if you have yet to read the series! That being said, I trust your better judgment, as far as if you wish to read this review. This is NOT a traditional review! It is more of an extended rant! Please don't scold me for not being more professional. If you want to read a level-headed, professional review, Google the book and take your pick. OK, let me start by saying that it is really evident that Weeks was a newbie author in this book. The first book had enough polish to show signs of a debut book that took time to cook, and went through rewrites and editors, etc. The Way of Shadows (book one) is still sloppy in places, especially toward the end, but it held together enough that I finished it with a positive vibe, and decided to move forward into the series. From the start, Shadow's Edge shows signs of being rushed through. Very predictable, shallow, easy decisions were made with the story line and dialog that left me either scratching my head or rolling my eyes with such regularity, it made me wonder what bizarre magical forces were at work to keep me reading. I won't recap the storyline in all it's detail, since I don't think it would be appropriate at this point. Rather, let me point out my major niggling issues. 1) Take a young assassin who achieves immortality and unbounded magical abilities and make him promise to give it all up for a woman. His childhood sweetie (if you will) makes giving up "wetboy" work for good a condition for her staying with him. Seriously! What, may I ask, is that!? I'll tell you: it's a blatant attempt to try and manufacture some tension. The guy was born/destined to be an assassin-superhero type! That's what he is and does! Are we (as readers) really to believe he would give it all up right after attaining mastery and preeminence, just because his sweetie thinks killing is yucky? It's obvious on the face of it that we will eventually see him choose what he is over who he wants to be with... except Weeks drags it out for over 300 pages first. In the interim, Kylar is a broke working man (in a little herbalist shop) who resorts to selling his master's beloved magical sword to get some money to support him, his future wife Elene, and the little girl (Uly) that they adopted. Weeks even has a scene where Kylar is in the kitchen cooking dinner, wearing a lacy apron with flour on his nose, because it amused Elene and Uly. GOOD LORD. Is the guy a peerless assassin or a pantywaist? 4) Another odd style quirk is the juxtaposition of strong language with direct quotes from the Bible. Yeah, our Bible, word for word, quoted and attributed to one of the Gods in the fantasy world. I wouldn't so much mind the scripture quoting if he wasn't also so free with the F-bombs. 5) The magic system has no rhyme or reason to it. Anything the author can imagine, he mixes in without explanation. At one point, the fabled sword Curoch is revealed to be a shape-changing weapon, automatically having the ability to become a different shape/style of sword as its drawn out of its sheath. First, it bummed me out because I had contemplated making a shapeshifting weapon for my own fantasy story, only different. I didn't kid myself into thinking it was an original concept, but it was sad to see the idea so poorly implemented. For almost two full books, there was no hint that the sword (Curoch) had this ability. It was revealed in a quick, off-handed way in one sentence, right before it was modified for the first time. "Oh, by the way, the sword can change shape too... yeah, because right now, it would be handy if the sword could do that!" It was the tacked-on and shoehorned things like that which rankled me more than anything. It reveals a lack of depth, and smacks of "winging it". Another example is this weird, monster super-beast thing at the very end, which is built out of people parts using "magic", and it grows by attacking and absorbing more people into it. It can modify its own shape at will as it add new materials. It rampages across a battlefield, covered with little mouths, and when it touches people, it attaches to them and consumes them and uses their bones/muscle to grow bigger and change it's shape. First it's a big centipede-thing! Now it's like a big bull! Now it's a dragon! Now it's a giant troll! Now it has 30 long arms, reaching out, grabbing soldiers, sticking them to its body, absorbing them! It's a free-form, shape-shifting puppet for the evil dude that controls it. It may work in theory; in execution, it was poorly explained and implemented, and showed no internal logic (as a concept) or restraint on the part of the author that created it. Like the magic system itself, it is so open-ended that it can do whatever the author wants it to do, without explanation. 6) There are plenty of other characters. WAY too many for me to track. I was constantly trying to remember who was whom. Weeks eventually killed tons of characters off, so it was starting to get manageable, but then toward the end of book 2, he introduces a slew of new characters. It was so disheartening. Because there were so many characters, there were also way too many storylines going on. Here I thought having 4 or 5 storylines in my own tale was going to be too confusing. Weeks left that number in the dust, three-fold times over. Believe it or not, in spite of all of this, the book managed to salvage itself by the end, and set up a third book. 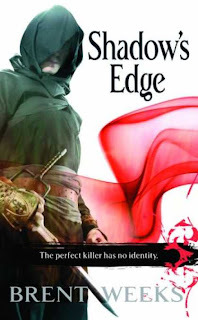 As hard as I've been on Shadow's Edge, the eternal optimist in me can't help but hope it was a learning experience for the author, and that perhaps by the time he wrote Beyond the Shadows (book three), he'd learned some things that helped him construct a tighter book. If the quality of the first couple chapters of Weeks' latest offering "Black Prism" are any indication, he's certainly stepped his game up a notch or three in the interim. So I will likely give Book 3 a shot, hoping book 2 was a misstep and no more. We'll see. Summary: 2.75/5 Barely managed to salvage itself. Different in feel and quality from The Way of Shadows (the first book), full of corny, forced situations and dialog, without a sense of depth or constraint or discipline. That's the enjoyable type of review, there. Yup, everything is defined by rules. Even magic, even chaos itself. In order to come up with a swell and solid magical system, one had better study Physics. I bought all three books in the trilogy in one go so I read the books one right after the other. If I remember it right, the second book was mediocre and read like a middle chapter of a bigger book. If I hadn't had the third book to read then, I would have given Brent Weeks a rating of 1 out of 5 in my review. Fortunately, I did have the third book. And it was a good read, though I was slightly disappointed. But maybe a more forgiving reader would not be disappointed like I was. I hope you don't get into trouble like you did that other time when you criticized a book! LOL. Ugh, soft magical systems are never any fun when it comes to literature. I think it works well with games and films, but books not so much. Give me some rules. Some science. Some definition. Something. Wow! At least you were honest. I like that. I haven't read the books yet, but look forward to reading them. Glad to hear you are going to go on with book three and the author started to redeem himself in the end.